Infant, the journal for neonatal and paediatric healthcare professionals, has published a special supplement on the sixth SIGNEC conference, which can be downloaded from the link below. Novel NEC therapy licensed for development shows promise for clinical trials. Professor David Hackam, Garrett Professor and Chief of Pediatric Surgery at Johns Hopkins University School of Medicine in Baltimore, USA, announced at the sixth international SIGNEC conference that the world’s first NEC-specific therapy, C34, has just been licensed to a company for further development. It is hoped that it will soon receive approval by the US Food & Drug Agency (FDA) for clinical trials. One of the main risk factors for the development of NEC is bacterial colonization of the intestines because the premature intestinal epithelium is predisposed to mounting an exaggerated inflammatory response. 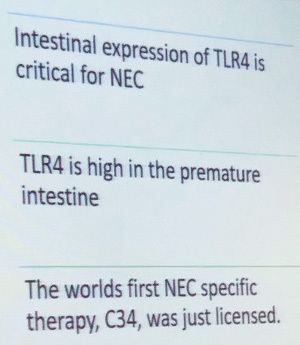 This is thought to be due to the increased expression of the bacterial receptor Toll-like receptor 4 (TLR4), which plays an important part in the regulation of normal gut development in the womb. The breakthrough in research by The Hackam Lab is based on the discovery of a compound that blocks the TLR4 cellular signalling process. “This discovery is a potential game changer for this disease and for the first time offers families hope,” said Professor Hackam, who has described necrotizing enterocolitis as a “phantom menace”. 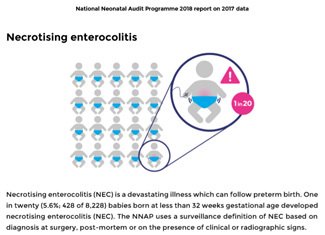 The National Neonatal Audit Programme (NNAP) 2018 annual report has been published and includes for the first time how many babies develop necrotizing enterocolitis. One in twenty (5.6%; 428 of 8,228) babies born at less than 32 weeks gestational age developed necrotising enterocolitis (NEC). WHEAT – Withholding feeds at transfusion to prevent NEC – trial. WHEAT – Withholding feeds at transfusion to prevent NEC – is an international randomised registry trial which aims to see if withholding milk feeds around blood transfusion can reduce NEC. It is a new type of neonatal study that uses routine data already recorded by doctors and nurses. Researchers also want to know the views of healthcare staff, parents and other groups with an interest in neonatal care. Please take part in their survey. Included in the survey is this video in which Dr Chris Gale and Professor Neena Modi describe the importance of neonatal point of care trials and how they can simplify neonatal research. May 17 is NEC Awareness Day!